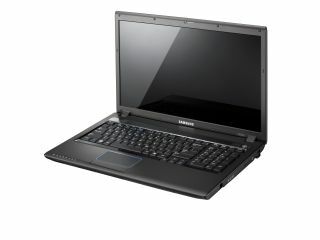 Samsung has announced the launch of the R720 notebook, with an HD screen and 3D sound, which joins the growing ranks of its R-Series. The new laptop, which will be available in the UK from July, features a 16:9 inch screen with a 17.3-inch LED-lit display, which means deeper blacks and more importantly, extended battery life. The R720 has a dedicated graphics card in the ATI Mobility Radeon HD4650 for 3D gaming as well as 4W stereo speakers with subwoofer for better sound. And to increase the 3D sensation even further, there's also the option for using headphones to get the SRS virtual surround sound experience with Samsung's Sound Retrieval System (which is commonly used on mobile phones). There's a desktop-sized keyboard for usability, with the bizarre yet slightly welcome anti-bacterial coating. USB-wise it's also very well stocked, with four USB 2.0 ports, with a combination port for both USB and eSATA for transfers of up to 3GB of data per second. There's also a chargeable USB port for powering devices even when the computer is off, which is something TechRadar thinks should be on every PC just for the sheer ease of use. Samsung says it has a "competitive price", although it has decided not to tell us what it is. Probably to eke out the suspense even longer... more sleepless nights for us then.